We're back with another edition of of teacher gift ideas! In the north, there are only a few weeks left of school before summer vacation. Have you thought about a way to thank your children's teachers for all their hard work during the school year? 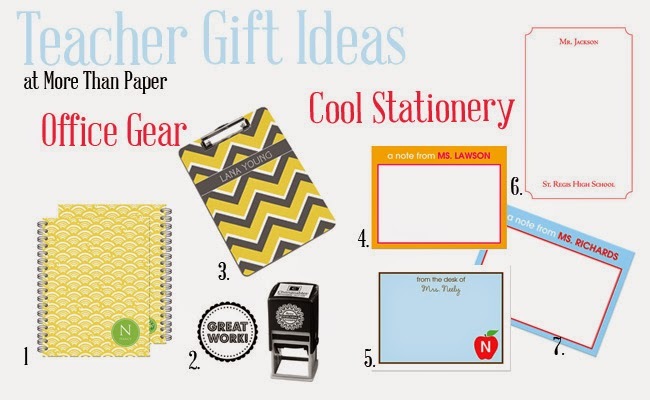 More Than Paper has you covered with personalized office products and cool stationery that any teacher would love. Make sure to accompany the gift with a handwritten note on your own personalized stationery. Take a few minutes to recall specific moments your child came home excited or happy about something they had done in school, cite any milestones they achieved because of the teacher, and show your appreciation for all they do. The teacher is sure to feel appreciated! Find all these products by clicking on the links here! (1) Personalized note book by Milo Paper (2) Great work stamp by Three Designing Women (3) Personalized clipboard by Devora Designs (4) Flat note stationery by Prints Charming (5) Flat note stationery by Prints Charming (6) Memo sheets by Chatsworth (7) Flat note stationery by Prints Charming. We have many other great teacher gift ideas on the site. Check them out or contact us for helping finding the perfect gift! We'd love to hear from our readers! Tell us why you love your teacher here or on our Facebook page!